Oxton Parish Council have been sent the following information advising residents how they can get hold of a ‘No Uninvited Callers’ sticker from trading standards. If you would like one for your property please use the contact details below. Any Doubt Keep Them Out! Trading Standards are warning people to be on their guard after an increase in the number of doorstep crime incidents since the warmer weather arrived. If you are not expecting a caller, Trading Standards advise that you don’t open your door. 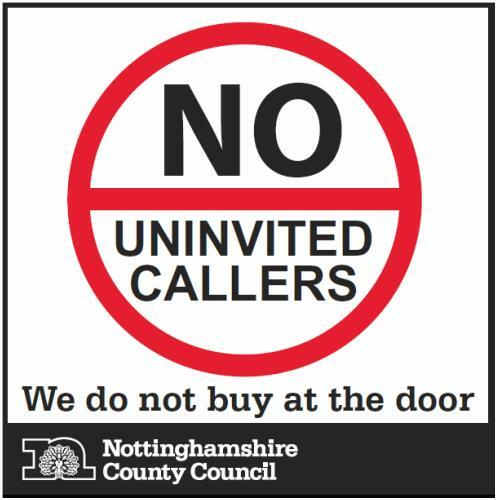 Anyone who would like a “No Uninvited Caller” sticker can contact Trading Standards on 01623 452 005 or email trading.standards@nottscc.gov.uk. If you agree to buy goods or services from a doorstep seller for more than £35 at home or work, you may have a 7 day cancellation period. This applies to visits made by a trader at your request as well as “cold calls”. The trader must give you a written cancellation notice. Please call the number below for further information. Any resident who would like to report a matter to Trading Standards or who would like advice on a consumer issue, can call the Citizens Advice Consumer Service on 08454 04 05 06.